Prince Caspian's mentor, half-dwarf and half-human Professor Cornelius (Vincent Grass), alerted the Prince about the birth and endangered life, and saved him (he first hid in a wardrobe) from the King's assassins with crossbows. He encouraged him to flee, and at the last minute gave the Prince Queen Susan Pevensie's magical horn: "Do not use it except at your greatest need." He warned: "Everything you know is about to change." As Caspian escaped on horseback into the Shuddering Woods, he fell from his horse onto the ground. He blew on his horn to summon assistance from two Narnian dwarfs. Red Narnian dwarf Trumpkin (Peter Dinklage) allowed himself to be a decoy and was caught by Telmarine soldiers, as his partner Black Narnian dwarf Nikabrik (Warwick Davis) concealed Caspian and saved him. Prince Caspian's horn blowing summoned them to Narnia, as the train station disintegrated around them. They found themselves on the beach below the ruins of the castle Cair Paravel, where they had ruled 1,300 years (Narnia time) earlier. Edmund deduced that the castle had been attacked by catapults. In a hidden treasure vault/chamber, they found golden chests with many of their belongings (including Father Christmas' presents, except Susan's horn was missing) from 1,300 years earlier. In the Council of Lords meeting at the Telmarine castle, Lord Sopespian (Damian Alcazar) thought it wasn't only coincidental but suspicious that Lord Miraz's nephew disappeared at exactly the same time as the birth of Miraz' son. To cover up the truth of his "blatant crime," Miraz blamed the Narnians. He described how Caspian had been abducted by Narnians (thought to be extinct or just fairy tales, after being driven deep underground), and presented captured Narnian dwarf Trumpkin as proof (a "fierce creature" from the woods). He vowed to capture Caspian (actually intending to kill him) and fight against the Narnians. Outside the ruins, the four Pevensie children rescued red Narnian dwarf Trumpkin (Peter Dinklage), who was about to be drowned by two Telmarine soldiers. After his rescue, he recognized them as "the kings and queens of old...Maybe that horn worked after all," and they continued on together. After being saved earlier, Caspian awoke in the abode of Nikabrik and talking badger Trufflehunter (voice of Ken Stott), where he was told that he was meant to save the Narnians, due to his possession of Queen Susan's magical horn. [Lord Miraz also suspected that the arrow (shot by Susan when saving Trumpkin) found in one of his Telmarine soldiers was a portent of magic.] According to Professor Cornelius (who had schooled the young prince all about Narnia), Susan (and her brothers and sister) had been magically summoned by the horn. He warned Miraz: "If Caspian does know of the Deep Magic, my lord would have good reason to be nervous." It appeared that Miraz was planning to imprison those who questioned and threatened his leadership, including Cornelius and Lord Sopespian. He ordered his General Gozelle to take troops to Beruna to search for and seize Prince Caspian. The Pevensies learned how Old Narnia and its talking creatures had almost disappeared in the centuries since they had left and the Telmarines had taken over. Lucy wondered why Aslan had "let this happen." Trumpkin told them: "You may find Narnia a more savage place than you remember." During their foot journey when they were stymied at a cliff's edge next to a deep gorge, Lucy believed she glimpsed Aslan, but it was only momentary and no one else saw him. Only Edmund believed her when she told them: "He wanted us to follow him." Meanwhile, Prince Caspian (accompanied by Nikabrik and Trufflehunter) proceeded through the forest toward Dancing Lawn. They were pursued by Telmarine soldiers with bows and arrows. They were aided by an unseen forest creature - a blade-wielding, swashbuckling mouse named Reepicheep (voice of Eddie Izzard). Four Centaurs from nowhere appeared, and in a war council gathering at Dancing Lawn in the forest, a throng of angry Old Narnian creatures and animals complained that the Telmarines had stolen their homes, land, and freedom. Fugitive Caspian pleaded: "You would hold me accountable for all the crimes of my people?" He vowed to help them as their King (he claimed that the throne was rightfully his, as King Caspian X). The badger Trufflehunter reminded everyone: "Narnia was never right except when a Son of Adam was king." Prince Caspian asked for their support to win the throne back for his Telmarine kingship: "Help me claim it, and I can bring peace between us." He claimed that the horn "brought us together" and they could take back what was rightfully theirs, including their land. 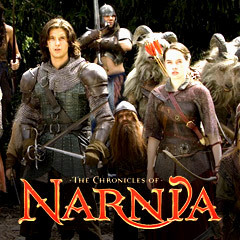 The Narnians pledged themselves to Caspian: "We offer you our lives, unreservedly" as Caspian announced that they must find more soldiers and weapons. The Pevensie group spied upon Lord Miraz' army and war machine at Beruna as it prepared for war (the enemy was building catapults and other implements of warfare). Back in the forest the next morning, after Lucy heard soft growling, she wandered away from the group and came upon Aslan (voice of Liam Neeson), who told her: "Things never happen the same way twice, dear one" - but it was only a dream. At first, when Caspian and the Narnians came upon the Pevensies (with Trumpkin), they didn't realize that they were his own allies ("A common enemy unites even the oldest of foes," Trufflehunter said). Caspian revealed that his group of Narnians (including Reepicheep) had stolen "enough weapons and armor for two regiments" from Miraz' forces. The combined groups traveled together to Aslan's How - where a huge barrow or mound of earth had been built over the ruins of the broken Stone Table (where Aslan was sacrificed in the first film). It was to be used as a "defensible" underground fortress. Impatient, Peter proposed pre-emptively attacking Miraz' castle (now mostly empty) instead: "Our only hope is to strike them before they strike us," although Caspian felt they had a better advantage at Aslan's How. Lucy felt that there were more than two options: "Dying here, or dying there." She reminded Peter that the White Witch had been defeated by Aslan, and suggested waiting for him to return, but an increasingly confrontational Peter objected: "I think we've waited for Aslan long enough." They followed Peter's suggestion of pre-emptive attack - and so, the night-time, surprise raid on Lord Miraz' castle commenced. First, Caspian released Professor Cornelius from his cell, and then held Miraz and his wife in their bedroom at swordpoint. He learned the truth of his father's murder after asking: "Did you kill my father?" The alarm was sounded that the castle was under attack ("For Narnia! "), and the Narnian forces stormed the castle's courtyard for fierce hand-to-hand combat and sword-fighting. But they were soon overwhelmed by Telmarine archers and swordsmen, and Peter called for his forces to fall back. Caspian and the Pevensies all managed to escape, but many Narnian fighters were trapped inside and killed when a giant iron gate closed. Back at Aslan's How, tensions ran high between Peter and Caspian about their plan, the failed attack, and Caspian's leadership. Their heated argument almost led to a swordfight. Lucy healed wounded dwarf Trumpkin with drops of liquid from her magical vial. Meanwhile in his castle, victorious Lord Miraz was pledged troop support from various provinces: Beruna, Galma, Tashbaan, and Ettinsmoor, as he was crowned King of Narnia and saluted: "Long live the King." After their defeat at Miraz' castle, dwarf Nikabrik told Caspian: "Your kings and queens have failed us," and then suggested using a different "ancient power": "There is a power greater still. One that kept even Aslan at bay for near a hundred years." A cloaked werewolf and an old hag were summoned, promising to help desperate Prince Caspian regain the throne: "Show me your enemies! What you hate, so will we. No one hates better than us." They guaranteed Miraz' death and more - as they proceeded with their ritual by drawing a circle around him: "Let the circle be drawn." The wizened old woman and the werewolf performed black sorcery to resurrect the spirit of the White Witch/Jadis (Tilda Swinton), frozen in a solid wall of ice. But Caspian objected: "This isn't what I wanted." However, the Witch Witch proposed to be freed from the ice with only one drop of his blood: "One drop of Adam's blood and you free me. Then I am yours, my king. Come on, come!" The hag cut Caspian's hand to draw blood, but were interrupted when Peter arrived (with Lucy, Edmund and Trumpkin). Peter killed the hag, Edmund killed the werewolf, and Trumpkin killed Nikabrik as he was about to kill Lucy. However, the manipulative White Witch further enticed Peter to free her ("Peter, dear. I've missed you. Come. Just one drop. You know you can't do this alone"), but she was run through by Edmund with a sword from behind as the block of ice shattered. King Miraz's hordes of army soldiers marched on Aslan's How, where Peter considered their next strategy would be to send Lucy and Susan on horseback into the forest to locate Aslan. To gain time while they sought Aslan, Prince Caspian (dubbed by Professor Cornelius as "The Telmarine who saved Narnia") suggested another traditional tactic. Peter and Miraz would duel one-on-one together "in order to prevent the abominable effusion of blood." So High King Peter, through Edmund, challenged Miraz "to single combat upon the field of battle. The fight shall be to the death. The reward shall be total surrender." Miraz laughed: "This is not a question of bravery." Although his troops vastly outnumbered the Narnians, he was goaded by his officers into accepting the challenge to duel Peter, half his age, to avoid looking like a coward. Outfitted in armor, the two combatants met. At the same time as they searched for Aslan, the two Pevensie girls were seen by Telmarine soldiers - so they separated. Lucy continued the ride alone, as Susan dismounted and stood alone to fought against the soldiers with her bow and arrows. She was rescued by Prince Caspian when facing death. She was brought back to the battlefield to watch the duel. During their dueling swordfight, both men were injured (Peter's arm was dislocated, and Miraz was wounded in the leg), but Peter was able to again cripple Miraz and stab him in the chest. Miraz taunted the young Peter to finish him off: "Too cowardly to take a life?" Peter replied: "It's not mine to take" and offered his sword to Caspian to finish him off. But Caspian also spared his life: "Keep your life. But I am giving the Narnians back their kingdom." As the Narnian side cheered for Caspian for getting back their land, treacherous Lord Sopespian stabbed his ruler Miraz in the back with one of Susan's arrows ("It is over"). His scheme was to pin the blame on the Narnians and frame them for the unfair death ("Treachery. They shot him! They murdered our king!"). He also prompted a major battle between the two forces. The Telmarine forces easily outnumbered the Narnian forces with their cavalry troop size, marching foot-soldiers, and a row of stone-throwing catapult machines, and were gradually winning. The Narnians vainly attempted to retreat back to the How, as Lord Sopespian gloated: "Crush them all." As Lucy rode through the woods, Aslan appeared to her and counter-attacked her pursuers. [Aslan played a very small role in the film, when compared to the book.] He told her again how things never happen the same way twice, and then promised to help the Narnian cause. With a loud roar, he awakened the sleeping trees around them. The first indication that the trees joined in the battle was when a giant tree root grabbed General Glozelle as he was about to kill Prince Caspian. Other tree roots from the Living Wood attacked the Telmarine army, and forced them to retreat to the river and bridge at Beruna. To confront and surround them from the other, far side of the river, Lucy (with a small dagger) and Aslan stood against them, as Aslan roared and summoned the massive river God to cause a flood, destroy the bridge, and kill Lord Sopespian in his powerful grasp. The battle was over when the remaining soldiers surrendered their weapons. Lucy healed wounded mouse Reepicheep, although the drop from her vial could not replace his lost tail - Aslan obliged and replaced it for him. There was a celebratory parade for the Pevensies through the streets, proceeding to the castle that was lit by evening fireworks. The next day, Caspian, now King of Narnia, announced to the Telmarines: "Any Telmarines who want to stay and live in peace are welcome to." He also added that if any of them wanted to return to the island of their origin, they could: "But for any of you who wish, Aslan will return you to the home of our forefathers" - and some chose the offer to make a new start, including General Glozelle and Lady Prunaprismia with her baby. Aslan returned them to their land through a magical tree portal. Even Peter proposed to leave Narnia - "Our times up. After all, we're not really needed here anymore" - he gave his sword to the new Narnian King. Susan reminded Caspian that they weren't going to come back, once they left - and this was confirmed by Aslan, who clarified that both Peter and Susan wouldn't return because they "have learned what they can from this world." During farewells and goodbyes, Susan gave a final kiss to Caspian, as the tune "The Call" (sung by Regina Spektor) played on the soundtrack, and they walked into the portal. The four Pevensies emerged in the Strand underground train station in London. Edmund realized he'd left his "new torch" (flashlight) behind in Narnia. With a production budget of $225 million, and box-office gross receipts of $142 million (domestic) and $420 million (worldwide). It was the 15th highest-grossing (domestic) film of its year. The film was based upon the second published, fourth chronological C.S. Lewis novel of the same name. This film was the last Walt Disney produced/distributed film for the film series - the next film in the franchise would be distributed by 20th Century Fox.